From my walk this morning. 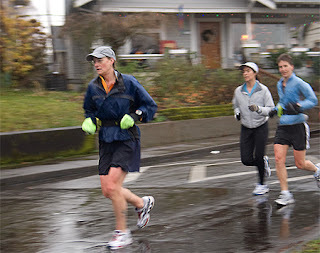 It was raining quite a bit, but I must have seen 25 runners this morning in the hour I was stamping around and trying to keep my camera (mostly) dry. I wish the woman at the far right didn't have her foot cut off. I was panning on the lead woman and the group just came along with her. I experimented with cropping out the runners behind but I like the shot, as it goes along with my photo concept when I saw the runners, with all three than only one.